Westerns and remakes run at the core of Hollywood tradition so much that it’s surprising it took the studios this long to get to The Magnificent Seven. Originally a remake of the cinematic classic Seven Samurai by legendary director Akira Kurosawa, The Magnificent Seven tells a story that deeply resonates because it has all the right ingredients: underdog heroes, revenge, righteous indignation, and standing up to ruthless villains even when the cards are stacked against you. 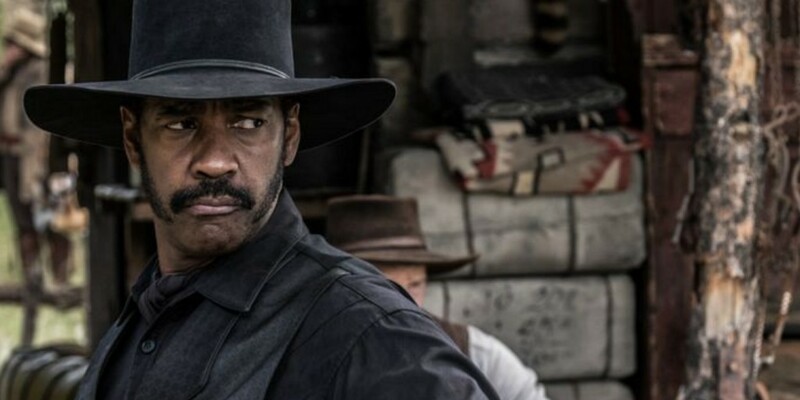 While Director Antoine Fuqua does his best retelling a classic and making it his own, he struggles to combine his signature style of a visceral, gritty, and grounded reality with the over-the-top action and silly humor this western requires. Too often these two voices are noticeably at odds, but it’s not enough to derail the narrative. Fuqua provides a solid experience with a thrilling opener and a satisfying end that’ll make it worth the trip to the theater. All in all, the remake is on par with the classic, updating to modern audiences, and bringing along beautiful cinematography in the process, but this remake is not able to exceed the original. 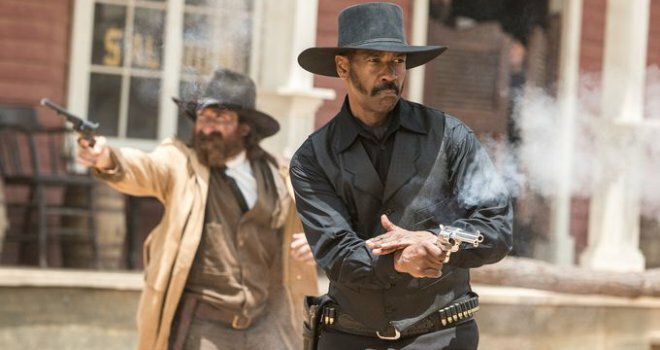 Written by Nic Pizzolatto (True Detective) and directed by Fuqua (Training Day), The Magnificent Seven is about Rose Creek under the control of the vicious industrialist Bartholomew Bogue. When Bogue burns down their church and guns down Matthew Cullen in front of everyone, Emma Cullen (Haley Bennett) seeks out a lawman to help bring Bogue to justice. She runs into Sam Chisolm (Denzel Washington) and asks him to help her. Chisolm agrees and sets out to bring a team together to defend Rose Creek from Bogue. For his part, Pizzolatto’s writing shines in the dialogue, character interaction and chemistry. However, the characters lack any dimension or depth, something unexpected from a writer who seems to only care about character. Of all the characters, Josh Faraday (Chris Pratt) is the weakest and most disappointing. Many of the other seven, like Ethan Hawke’s Goodnight Robicheaux, get compelling back stories and a history with Sam Chisolm. Faraday is a hollow character with no back story or motivation except that he’s a gambler who needs to get his horse back from Chisolm. That’s too watery of a motivation for a supporting character who shares a significant amount of screen time with Washington. Somehow we’re supposed to think Faraday is cool, funny, and likable, and thus ignore the fact that despite all that, we don’t know a thing about him. 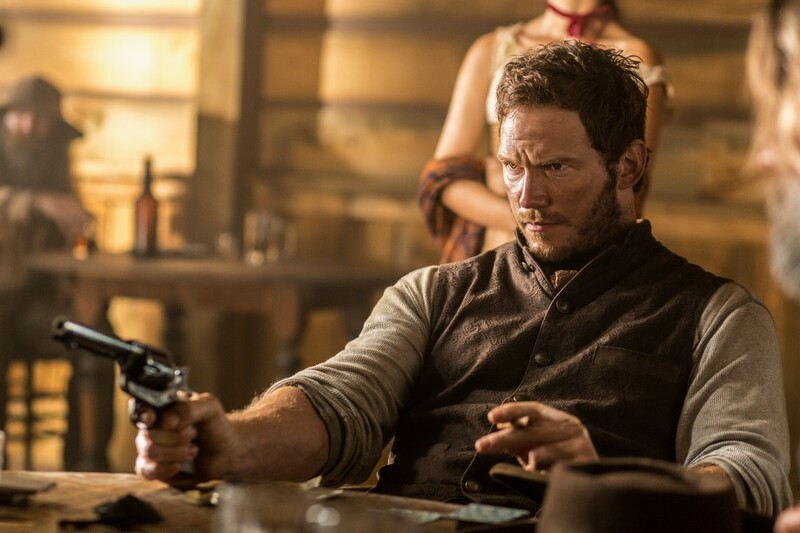 Along with poor writing for Pratt’s character, Pratt can’t seem to find his acting voice outside of a goofball with a masculine exterior. Throughout the beginning, his over-acting is sadly noticeable. He wants to be a Clint Eastwood type, but overemphasizes the lip snarls and eye scowls. He’s a one-trick pony thrust into a much larger world and can’t adapt fast enough to prove he’s worthy to be in the big leagues. This is in direct contrast to Washington, a veteran who practically wrote the book on how to act like a total badass. Even in a movie with sloppy writing or weak characters, Washington’s steady hand can lead any audience along for the ride and make them enjoy it. His performance in The Magnificent Seven is no different. While he did get the benefit of a better written character, he also just knows what he’s doing. Unfortunately for Pratt, Washington’s prowess brings out his inexperience. It’s clear Fuqua is having fun with a genre that is right up his alley. His sincerity to live up to the original and desire to make a good Western shines through. The opening scene with Bogue burning down the church is nail-biting, edge of your seat, intensity that Fuqua excels at. However, he muffles his voice in the middle and it turns more into a light-hearted, action caper with a lot of silly, goofy humor until the end where he brings you back to his grounded style. This back and forth isn’t a sudden change, or out of ordinary, but it feels more like two competing voices struggling to win. Despite some weak characters and a clash in tone, The Magnificent Seven proves to be a solid western intent on creating a fun experience while doing its best to honor and recreate the magic of the original. The story will please both newcomers and old fans, but no one should expect it to exceed or add anything new to the original.